September 2nd started for me at 12:50 am when my water broke. We were checked into the hospital at 2:06 am and there we stayed until Friday September 6th. Our little man, Stephen Anderson Lunt made his debut on September 2nd at 11:35 pm. 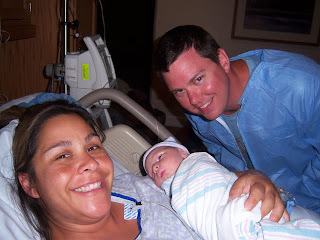 After laboring for 23 hours, Dr. Bing decided that I was not going to dilate any further than 9 1/2 cm so and our only option was to give me a c-section. We did everything we could to stick to my birth plan, but Stevie had other ideas. Stevie was weighed 7 lbs 5.5 oz and is a whopping 21 inches long. Andy was in the OR with me and took the very 1st pic of Stevie. Andy is the most amazing daddy ever. He is so gentle and loving. I think that Stevie is going to be a daddy's boy. He perks up when Andy comes into the room. I am so thankful that my parents were here with us. I am not sure that I could have done this without my mom and dad by my side. My parents arrived in Jacksonville on August 25th and left on September 8th. I was not ready for them to leave us. But being the eternal daddy's girl that I am, I was able to have my very last week of mom, dad and Dana time. We went for daily walks on the beach, did some shopping, put up shelving in Stevie's room and got some actual lounging on the beach time. I know that from here on out the focus will be Stevie and I will be a distant memory. My prayers were answered when he was born 30 minutes shy of my parents 37th wedding anniversary, being as how we were not able to take them to dinner as planned they got the next best thing, their 3rd grandson and 6th grandchild. Kamie and Aunt Brittany drove from Tallahassee just to see Stevie on Wednesday. It was a nice surprise. The next day we got the best fruit arrangement from Kamie, Grandpa Roger, Uncle Alex and Aunt Brittany, Aunt Amanda, Aunt Amelia and his cousins. It was a very welcomed gift, considering I had not eaten anything except popsicles since 7:30 pm on the 1st. I think that I ate most of it before we thought that maybe we should have taken a picture of it. On Monday we had our 1st pediatric appointment with Dr. Cooper. Stevie was on his best behavior. He did not cry once. He has gained back 4 oz of the 9 that he lost since birth. He is a whole 7lbs now. He is in the 20th percentile for weight and head circumference and 80th percentile for height. Considering that I am 5' 1 1/2" tall and Andy is 5' 9" tall, we are still trying to figure out where he got the height from. Kamie is here this week to help out with Stevie. I am so thankful to her for missing work to stay with me during the day. Well, it is getting late and time for another feeding, so I better sign off. I promise to post more pictures and blog more often. It has been a while since my last post...this pregnancy thing is tiring, in case you did not know that already. We found out last Monday that we are having a little boy. Stephen Anderson Lunt is already a little dancing machine like his daddy. I hope that when he is older, he will not want to take tap dance classes. I call him my little Sammy Davis Jr. and James Brown rolled into one. We went boating on Sunday on a lake with all of our friends. Stevie enjoyed a lazy day of laying out in the sun. The most excitement that we had all day was our jump overboard when a hornet almost stung us. He jumped around in excitement everytime the jet ski's came zipping by the boat we were on. I think that he is going to love water sports. Stevie also like the following musicians / bands: Linkin Park, Justin Timberlake, Duran Duran, New Edition...(yes, I went there), Chris Cornell, N.K.T.O.B., N.E.R.D., Anything 80's....and many more. Andy is not here to remind me which cd's we listened to on our way to Tallahassee 2 weeks ago. Maybe one of these days I will figure out how to add a music player to my profile (hint, hint). He also loves the duck book that Aunt Elaine, Uncle C.F. and all his Connecticut cousins sent him. I think that Andy and I will have to take him to Boston when he is older to see where he went on his 1st vacation in my belly. It is getting late and Stevie is starting to get active, time for bed. The last few days have been a whirl-wind. Andy turned 31 on Saturday so we went away for his birthday weekend. This weekend was actually a 5 day trip. We started off on our journey in Connecticut to see Elaine, C.F. and the cousins. We got to see the UConn campus, then on Thursday we were off to Boston...which by the way was VERY COLD. Kyle, Tice, Ellie, Ticen, Andy and I had a great time. We went on a nice trolley tour of the city. I am so glad that we decided to take the trolley, I don't think that the belly and I would have been able to make the 2.5 mile treck around the Freedom Trail. After the 5 hour ride home, after a pit stop to allow me to puke. I think that the belly had enough of the car and that was her way of telling me that we needed a nap; thanks for driving Kyle, we made it back to Elaine's in time to watch LOST. Friday morning we went to breakfast where I had the BEST pancakes ever. I don't think that I will ever be able to eat pancakes without Ice Cream again. Friday afternoon we took the Metro North to NYC. We had a heck of a time getting a cab once we arrived. The only cab that were willing to stop for us were the gypsy cabs which we were told to avoid. After waiting for an hour for a cab we ended up with a gypsy. The cab ride was not too bad. We stayed at the Mellinuem Hilton on the 28th floor overlooking ground zero. The fun started on Friday night. We went to a neighborhood restaurant called Edwards in Tribeca for dinner. While we were there, I noticed this beautiful hunk of man in the mirror...it was Andy, but on the other side of him was a nice pair of eyes looking back at out table. After staring at him for a while it hit me like a ton of bricks, it was JOSH HARTNETT. Yep!!! What a great way to start out our NYC leg of the trip. Saturday we took the subway to the Natural History Museum and wandered into Central Park. While there, we stopped at Strawberry Field. I took a few pictures of the John Lennon memorial and then again at the Dakota Bldg. Our next brush with the rich and famous happened at the Dakota Bldg where I almost walked over Yoko Ono when I turned into her. I thought that she was some random Asian woman until the door man said "Are you alright Ms. Ono?" at which point I demanded the camera from Andy but by the time I got it in my hot little hands, she was gone. Shucks!! Saturday night we went to dinner with Peter and Inez again and then off to bed to get up at 3:30 am to get a flight back to reality. Overall I think Andy had a great birthday weekend all thanks to Amanda & Ryker for the airline tickets, Natalie and Tice for being such tour guides and to Elaine and C.F. for being wonderful hosts. Andy is a die-hard Florida State Seminole fan. Dana is a die-hard Andy fan. We LOVE going to the beach from March to September (good thing...since we live a hop,skip and a jump away) so, come visit us anytime!! We are expecting our 1st little Lunt on September 4th. It has been a long and stressful road to get here, so we are thankful that we are given this chance, and that our baby is developing perfectly.